Whenever anyone meets us (as a couple), and they find out what I do, the average first response is- “Wow, you’re a lucky guy, she must cook all the time”. And always the answer is, “actually, not really”. There are several reasons I don’t cook that often at home. One of them is that I’m around food- cooking, styling, prepping, and tasting all week, that when it comes time to eat at home I usually don’t have much energy. But the main reason has to do with Assaf. From the day we met I understood that food wasn’t his thing. When we first started dating, on one of the trips he took to visit me in the States, I drove him six hours in the car to a small fishing village in Mexico known for their fresh lobsters, only to find out he really was not into lobsters. On our first trip to Paris I took him to a restaurant (Frenchie Bar) where there was not one thing on the menu for him to eat. He watched me eat and drink and enjoy while he just sat there. But when it came to cooking at home it took me awhile to realize that it really didn’t matter what or how much I cooked, but that he was just as happy eating rice crackers, some vegetables and cottage cheese for dinner. For years I would try to impress him with fancy dinners, interesting recipes, hosting parties for friends, until one day he simply asked me to stop. I told him that that was one way (did someone say Jewish mom syndrome?) of me showing my love for him. And he blatantly told me that he’d much prefer show my love in other ways. And so after quite some time, I let go. I stopped stressing about meal planning, about food shopping, and what to make for dinner. Until… he decided to go vegan on me. For awhile, he was totally fine with eating brown rice and mung beans and a roasted sweet potato everyday, but I, on the other hand, couldn’t take it. I felt horrible that he was eating the SAME thing everyday for weeks. So I started researching vegan recipes and I started playing around in the kitchen trying to make things that would be tasty, fitting to his diet, and again, show him how much I love him. This recipe has had many lives. I started by cooking the vegetables along with the lentils, and then tried to roast them instead and the outcome was far better. I was also lucky enough to bring back some really good quality paprika from a recent trip to Budapest which adds a really nice smoked flavor. Preheat oven to 200C/400F. Line two baking trays with parchment paper. 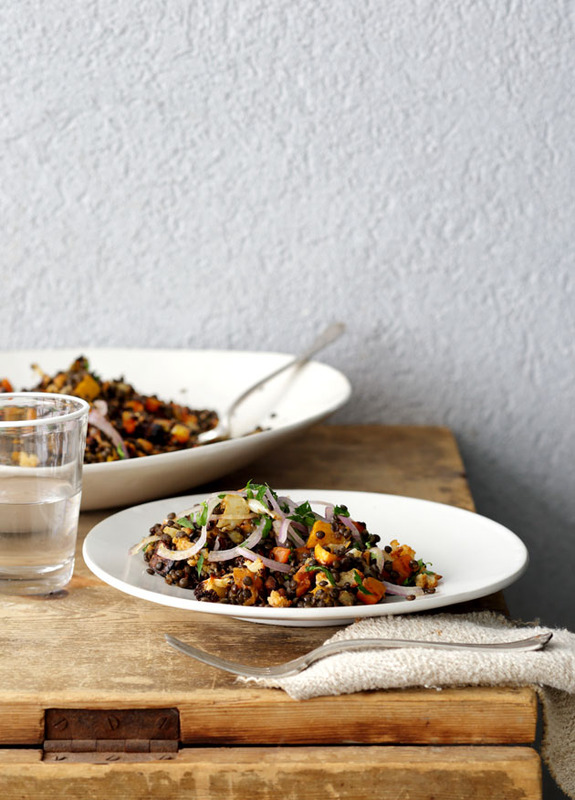 In a large saucepan, cook the lentils in boiling water (without adding salt) until al dente. Strain and allow to cool to room temperature. Place all the vegetables in a large bowl and season with paprika, cumin, olive oil and salt. Place the seasoned vegetables onto the prepared baking trays, making sure they are in one layer (this will help them each get browned evenly and not leave some soggy). Place vegetables in the oven and roast for 25-35 minutes, until golden brown. 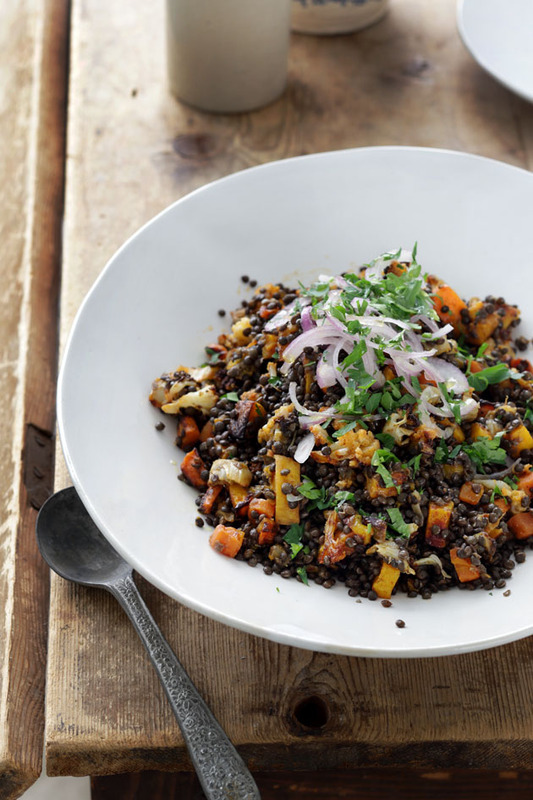 In a large serving bowl, mix together the lentils and the roasted vegetables. Taste and season accordingly. Garnish with the olive oil, chopped parsley and red onion and serve either cold or at room temperature. The recipe doesn’t include the 1 whole head of garlic, skin on, cut in half?